Here in Anyvape TeCab, this is a list of the world-class Anyvape TeCab E Cigarettes, such as TeCab Starter Kits, TeCab Dual Kits and related TeCab Accessories. Anyvape Tecab is the first portable E Cigarette that takes a replaceable 10440 battery, which is seldom seen on a lightweight starter kit like 510 and 510-T series, also, the compatibility of the TeCab E Cigarette is the best, it's compatible with almost all eGo and 510 series Atomizer, this makes the TeCab E Cigarette more flexible and convenient. Every items listed here are quality certified and guaranteed. 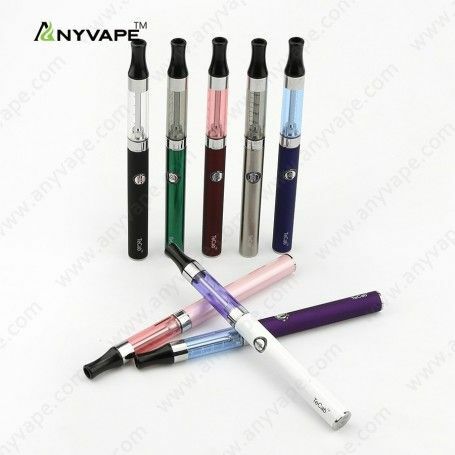 Anyvape E Cigarettes are stylish, convenient and economical alternative, the most important it would bring a healthy lifestyle for traditional smokers without quit smoking. 510 thread makes it compatible with most of the atomizers, Cartomizers & Clearomizers, which keep you more economic & convenient to get replacements. 5 click off battery protecting control system more safer and more energy saving. 360mAh rechargeable 10440 battery with USB charging case, slim, stylish and safer. Quality wick and resistance assembled 1.8ohm, 2.2ohm resistance available. Slim flat wall adaptor, 5V 500mAh output, not only for your e cigarette but for your mobile phone and more.